Sometimes the sweetest things pop up into your world and get you so giddy people can’t help but notice your happiness. I found this precious golden prize beaming from among many eclectic and random items typical at a flea market booth. Throughout the rest of my scavenger adventure at the Irvine Flea Market at the Great Park I was approached by aficionados of my piece I so proudly cradled under my left pit. Sure enough, everyone commented fervently on the vintage telephone stand that the seller talked at length of its original function. And just as everyone observed as they halted me in my tracks, yes, it was in great condition and yes, it was a deal…$15. My husband wasn’t thrilled about it as I lugged it into our nest (another piece of junk is what he believes.) Good thing I was thinking about the narrow space next to my bedside where he didn’t have to gasp as he passed by my sweetest little thing. Doesn’t it look dandy with a few reading materials? 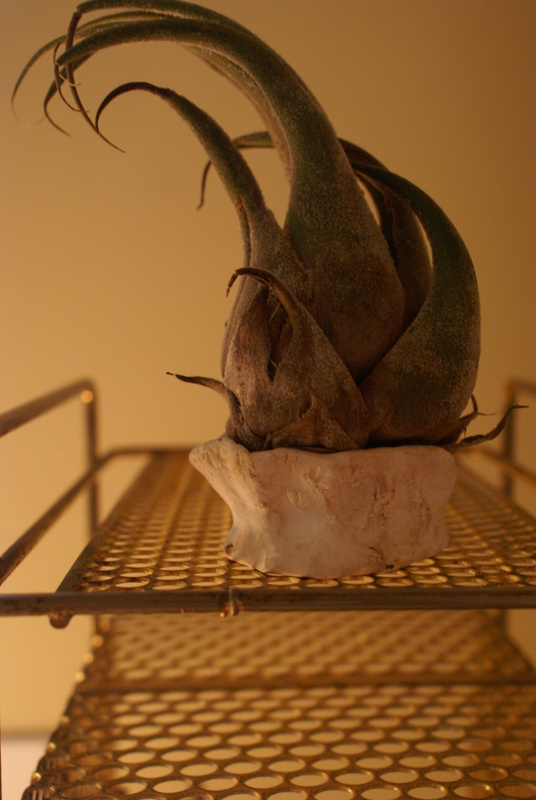 In lieu of a telephone, I don’t care for a phone in my bedroom especially next to my ear; I plunked this air plant on top of the honeycombed narrow ledge. It sits on an artisan made mini-planter created by one of my favorite little artists, oldest bear. Yes, this golden telephone stand is the sweetest little thing. The precious air plant is from Laguna Nursery and it has been the ONLY air plant in my care that has thrived for about four months now. This one supposedly blooms…I’m still waiting Ruben. 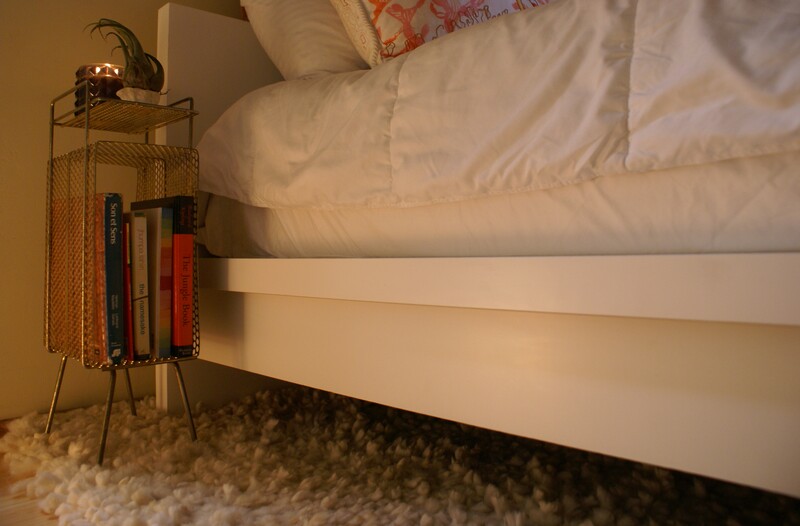 When stacking reading materials near your bedroom remember that less is better for a restful night’s sleep. You don’t want to turn your sweet dreams into too many crazy adventures with too many stories by your side. Do you have a recent addition in your nest that makes you gush or swoon? Yes, I was lucky to have spotted it. I can see how one can pass things up with all the items splayed out…so much for one to take in especially at the speed I prefer to go. I don’t think I converted my husband into liking this piece but I appreciate him for letting me enjoy it. Thank you! I love how there is a word for bedside table in Greek. Oh my gosh, it’s beautiful! What a great deal too. I see this kind of stuff in Brooklyn selling for oodles more..! Hope you had nice travels — sorry to miss you! Thank you! We had a great time thanks…maybe next visit to the Big Apple! Oh, I know that feeling. Let’s think that it was just waiting for you to find it! Yes, I like that thinking!